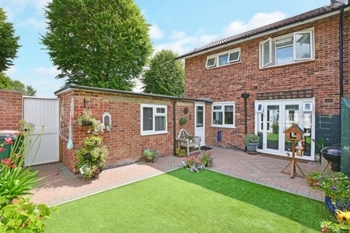 Guide Price £325,000 - £350,000 conveniently located for Crawley Town Centre and Train Station is the superbly presented and extended three / four bedroom end of terrace family home. Benefiting from off road parking and a newly built oversized detached garage this property is a must view. On arrival you park on the brick block driveway and enter through the double glazed door into the spacious entrance hall. 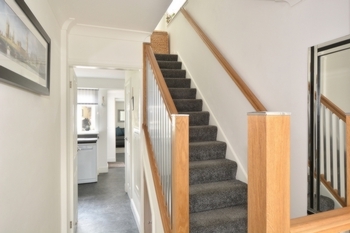 Within the entrance hall is a double coats cupboard, a remodelled stair case leading to the first floor and wooden glazed door in to kitchen. On entering the kitchen you will notice the modern cream base and eye level units which are complimented by newly fitted work surface. 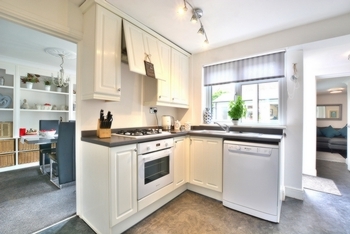 There are some built in appliances such as a gas hob, oven and extractor fan with matching door unit. Space is provided for the dishwasher. There is a built in larder cupboard which also houses the boiler and a recessed area for the American style fridge/freezer. 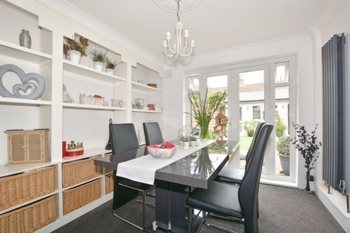 The kitchen provides access to the lounge, utility area and bedroom four/playroom/study. 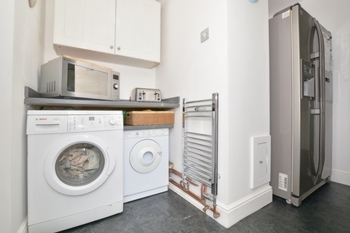 The utility area is open plan to kitchen and an ideal space for the washing machine and tumble dryer, a small work surface has been fitted and a double eye level cupboard. Moving through the utility area a further wooden glazed leads nicely into bedroom four, study or playroom. Within the room is a newly fitted cloakroom with was hand basin. 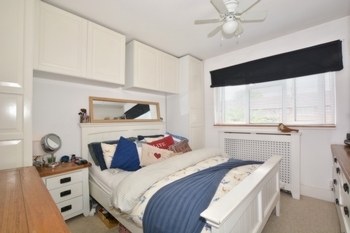 This room could cater for a single bed and free standing furniture and has a side aspect window. 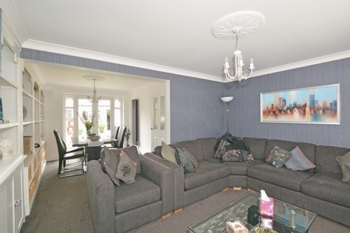 The open plan living area is light, airy and is beautifully presented. 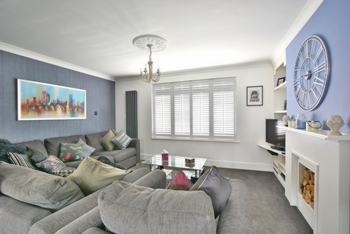 Within the lounge area space is provided for a large sofa and arm chair the focal point being a wooden fire place surround with an inset recess currently used to store logs for decoration purposes. Wall mounted shelving has been fitted which is used for the TV and other viewing essentials. A front aspect window with modern wooden window shutters allows in plenty of natural light should you want or keep the shutters closed for total privacy and seclusion. The dining area can comfortably hold a six seater dining room table chairs and provides view over the rear garden through the double open French doors which lead directly out to the garden and patio. Along one wall is a range of recessed display shelving with a low level double cupboard. 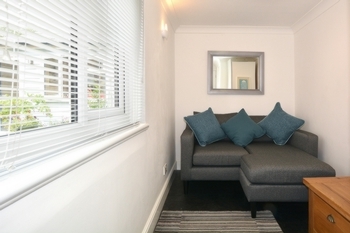 The first floor landing provides access to all the first floor bedrooms, bathroom and separate W/C. 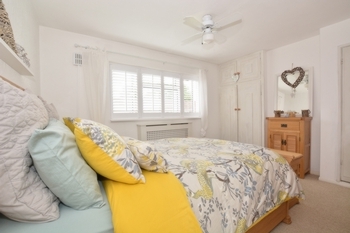 The master bedroom is situated at the front of the property and can comfortably hold a super king size bed and benefits from two double built in wardrobes. 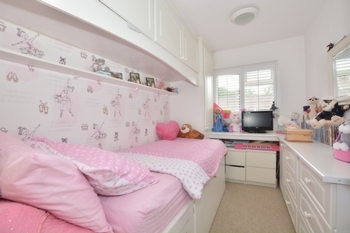 Bedroom two can comfortably hold a king size bed and benefits from a range of built in wardrobes and overhead cupboards. 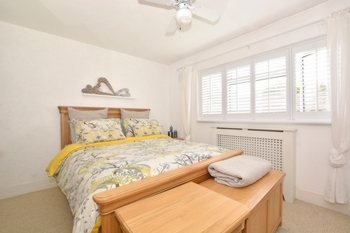 Bedroom three is a generous single bedroom which benefits from a built in single bed with storage cupboards and front aspect window. The family bathroom has been re fitted with a white suite and comprises a P shaped shower bath with attachments and a wall mounted shower unit and wash had basin. 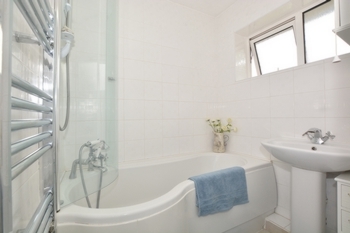 There is heated towel rail and rear aspect window. 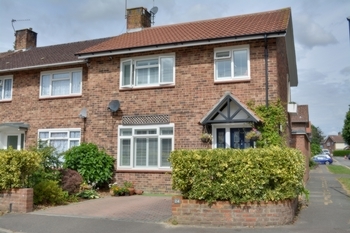 Located next to the bathroom is the re fitted separate W/C with window. Outside to the front of the property is the front garden and driveway for one car. 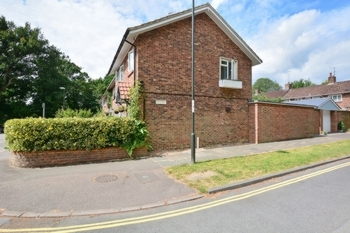 Located at the side of the property is a side access door which leads directly into the rear garden. 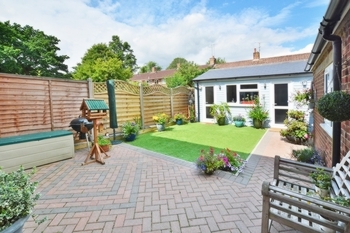 A newly laid brick block patio extends to the rear of the garden and creates a lovely seating area. An inset area of Astro Tuff has also been laid. At the rear of the garden is the 15'7" x 13'1" oversized single garage with pitched roof and internal loft. With an electric up and over door. Power and light, double glazed window and a pull down ladder to access the internal loft area. A storage area has been created at the side of the garage with its own personal door.